Two events in May will advance the conversation as Major League Lacrosse’s (MLL) Ohio Machine will open its season at home on May 8 and will hold games closer to downtown Columbus in an effort to engage fans across the city. On May 22, The Ohio State University (OSU) will be first-time hosts to the Quarterfinal Rounds of the 2016 NCAA Men’s Lacrosse Championship at Ohio Stadium. The Machine (1-1) opens up its home schedule this Sunday vs. the Denver Outlaws at 2:00 p.m. at Panther Stadium on the campus of Ohio Dominican University. 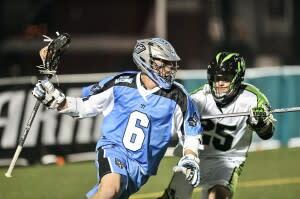 The team has made the MLL Playoffs the last two seasons and hosted the playoff semifinals in 2015. As a partnership with the Greater Columbus Sports Commission and the Machine, fans can purchase the first two home games at a discounted rate when purchased online using promo code GCSC (in all caps). 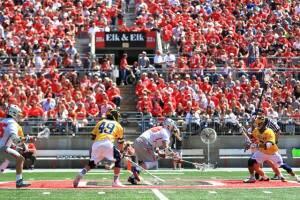 Continuing the trend of Lacrosse in Columbus, OSU will host the Quarterfinal rounds of the 2016 NCAA Men’s Lacrosse Championship on Sunday, May 22 at Ohio Stadium. Four of the top collegiate lacrosse teams will compete in Columbus as they try to punch their tickets to the semifinals. Down the road, Columbus will look to add another piece to its lacrosse community and have representation across all levels- professional, collegiate and high school. By 2017, there will be enough boy’s lacrosse teams in Ohio to qualify it as a sanctioned sport of the Ohio High School Athletic Association, which means bringing a state championship tournament to Ohio. The state’s current annual high school lacrosse tournament, run by the Ohio High School Lacrosse Association, is played at Upper Arlington High School. Lacrosse has definitely come to the forefront in Columbus and the future looks bright. Tickets for the NCAA Men’s Lacrosse Quarterfinals are on sale now online and at the Athletic Ticket Office at 1-800-GO-BUCKS. All tickets include both games. General admission tickets are $25 for adults and $15 for child/senior. Reserved club seating is available for $30 for adults and $20 for child/senior. Tickets for groups of 10 or more are available for $10 each and may only be purchased by contacting Kris Adams at 614-292-8098 or adams.1885@osu.edu.